For some of you more eagle-eyed readers you may remember a post titled Footwear Friday. It was a ‘blink and you miss it’ kind of post as I didn’t do many of them and it certainly wasn’t a weekly theme as I couldn’t dedicate enough time to it. So, I’ve changed it. After all, I am a massive shoe lover and don’t want to tie myself down by just posting on a Friday… Here it goes. 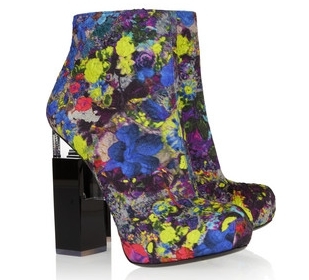 I found these Nicholas Kirkwood for Erdem boots on a pretty typical browse of net-a-porter.com. I don’t know where to start with these. They are just on a whole other level of incredible.The bold and brassy printed silk is beautiful. It juxtaposes nicely against the geometric, clear heel. Nicholas Kirkwood has to be one of my fave footwear designers, with Erdem being one of the collections I always look at come fashion week. Together, for me, they make the perfect pairing. You have the slightly risky, bold, creative, edgy shoe of Kirkwood, mixed with the beautiful, dainty, multicoloured print of Erdem. I want to wear them with jeans, with thick tights and dresses and of course, my leather shorts. They would make any outfit look a million times better. Imagine all the compliments your feet would receive. Unfortunately for me, at £895 I can only dream about owning them. At least that’s the plan for tonight. Next Post If you’re not wearing sequins, you’re not coming in! I am actually going to have to stop reading your blog.